Things have really been "popping" in the heat of the summer! CASE Policy and Legislative committee, chaired by Phyllis Wolfram (MO) has been very busy over this past year! They have once again revised the CASE ESEA brochure just in time for the Legislative Summit AND for you to use with your Senators and Representatives while they are home on their August recess. ESEA is at a critical point. There will be many decisions made during the conference committee work. The House and Senate versions are polar opposites and so it is up to all of us to speak to both Senate and Representatives to point out what is important to our schools, students and communities! Click here for the most up to date version of the CASE ESEA recommendations! Speaking of talking to your legislators during their August Recess... CASE Legislative Consultant, Myrna Mandlawitz, has put together a short explanation of NDD and Sequester. Be sure to read it in this issue! Hopefully, it will help you explain to your delegation how important it is for the Congress to remove Sequestration! Speaking of Policy/Legislative Issues... Maintenance of Effort is one of the issues the Policy and Legislative committee has been working on for over 5 years! Some of our members are in dire financial straits due to decisions made by Governors and state legislatures. CASE has worked with many folks over this time and there finally was an option that seemed to provide relief to the LEA but at the same time protect students with disabilities from budget fights! Let me make it very clear, CASE does not want to eliminate MOE! We just want to correct some unforeseen consequences given the budget decisions being made in some states. If it isn't a problem in your state now, just remember it only takes one decision by either the Governor or your Legislature for it to become a big issue for you! Rep. Walberg (MI) has introduced a bill which CASE is supporting H.R. 2965. To find out more on the bill go to www.thomas.gov and then enter in the H.R 2965. Speaking of MOE... I attended the OSEP meeting in DC this past week and there was a session on MOE for LEA (Local Education Agency). While OSEP is bound by the law, they did relook at the regulations to see if there was anything they could do to assist the LEAs. They have developed a power point, a cross walk between the former regs and the now current regs and a Q & A. CASE has also offered to work with OSEP to make sure all directors know how to maximize their dollars and accounting in ways to prevent an MOE failure. What are some things you feel you need in order to better understand and therefore meet MOE? Let us know as OSEP leadership are sincere when they say they do want to help. We now have the list of the breakout sessions for the fall conference. Even though you missed out on the Early Bird registration, the price is still a bargain! The price includes 2 lunches, 2 breakfasts, and lots of snacks as well as quality keynoters and amazing breakout sessions! A tentative schedule for the conference is ready for you to check out by clicking here and also look at these practical, cutting edge breakout sessions! Mark your calendar now and register as soon as you can. Don't forget to get your room as they are going fast! Click here to reserve your hotel room and remember to use the code "case." 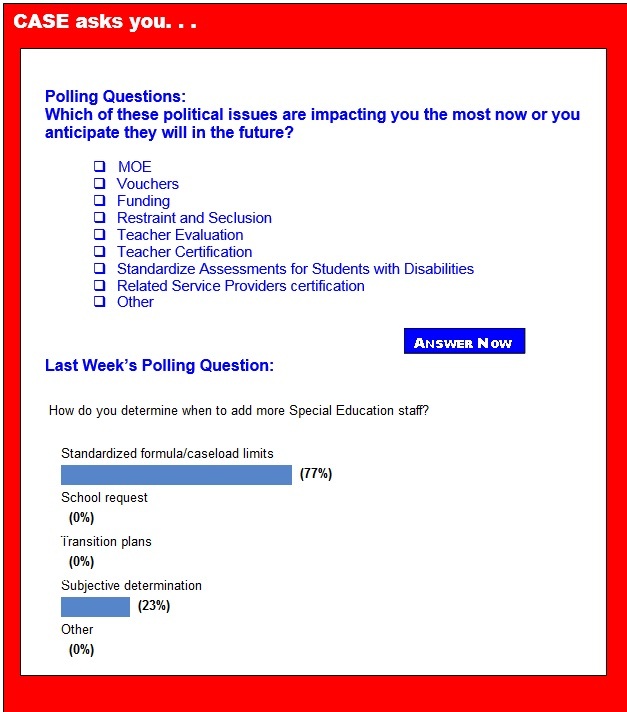 Last Week's Poll asked, "How do you determine when to add more Special Education staff?" and of those answering the poll, the vast majority (77 percent) said they used standardized formulas/caseload limits to determine those needs. All the rest (23 percent) said they used subjective determinations. Does this surprise you? I was not surprised about which came in first and second, but I am surprised no one said school requests played a roll. I would be very interested in seeing some of your standardized formulas/caseload limits ... and I bet others would like to see them too ... perhaps you would be willing to share them with us — you could even take off the school district or any identifiable notations. Just send them to me at lpurcell@casecec.org. Understanding the federal budget caps: It's not just NDD! In 2011 Congress passed the Budget Control Act to address the growing deficit. The BCA calls for $1.2 trillion in deficit reduction through 2021 — $984 billion in budget cuts and $216 billion in reduced interest payments. As part of the BCA, the Joint Committee on Deficit Reduction — the Super Committee — was appointed to determine where to cut. However, the Super Committee was not able to meet its mandate, triggering the process of sequestration or automatic across the board cuts in all discretionary spending — education, health, social services, environmental protection and all other agencies, including defense and homeland security. Federal education officials are reminding schools not to skimp on needed speech and language services for children with autism. In a letter to states, officials from the U.S. Department of Education say they've heard that an increasing number of kids on the spectrum may not be receiving services from speech-language pathologists at school. Moreover, such professionals are frequently left out of the evaluation process and are often not present at meetings to determine what services a child should receive under the Individuals with Disabilities Education Act, the department said. Twenty-five years after the Americans With Disabilities Act passed, schools and other public spaces have made strides to accommodate children and youth with disabilities, said the participants at a U.S. Department of Education event to honor the civil rights law. But there is still work to be done on making the promise of the ADA the "delivered reality of our kids in schools," said Catherine E. Lhamon, the assistant secretary for civil rights at the department. The U.S. Senate has passed an update to the much-criticized No Child Left Behind education with a vote of 81-17. The bill cleared a week after the House barely passed its version of the rewrite of the 2002 law. This win was one that Republican supporters had worked months to achieve. Maggie Severns and Kimberly Hefling, writing for Politico, say it is now time for the two chambers and the Obama administration to negotiate a bill that will be acceptable to the President and House Republicans. The House GOP members passed their bill without any Democratic support and under the threat of having it vetoed. At a school in Cordele, students with behavioral disorders must use segregated restrooms. They have separate lunch periods. They have to enter through a special door and, unlike their peers without disabilities, pass through a metal detector. In Rome, students in the Georgia Network for Educational and Therapeutic Support program aren't allowed to engage with other students — or even leave the basement. "School," one student said, "is like prison where I am in the weird class." Through such programs, Georgia illegally segregates thousands of students with behavioral or psychiatric disorders, often in schools that are dirty, in poor repair and, in some cases, served as blacks-only facilities before court-ordered integration, the U.S. Justice Department charged this week. No Child Left Behind's one big achievement? Nearly two decades ago, when Ricki Sabia insisted her 5-year-old son could read, his public-school teachers didn't believe her. He didn't have a clear reading voice, Sabia explained, so they couldn't understand him. "His expressive-language issues were a big barrier and caused inappropriately low expectations," said Sabia, whose son, Steve, has Down syndrome. "It wasn't until he started taking state assessments and far exceeding expectations that they started to take my observations about his abilities seriously and stopped trying to get him into special-ed classes." Test scores have improved and online bullying incidents have been virtually eliminated at a California school that added weekly digital literacy instruction to its curriculum five years ago. In response to an online bullying incident in 2010, parent Diana Garber and Journey School, a public K-8 charter with 400 students in California's Capistrano USD, created the Cyber Civics curriculum for the middle school grades. For at least 100 times over the past several days, I've listened to Vivian Green's rendition of "Oh, Freedom." Her performance was morally powerful, personally humbling, and haunting in a bittersweet way. In its courage and moral power, it offers lessons to those of us concerned about the needs and dignity of children and adults with disabilities. There are so many concepts, skills and standards to be covered in any given school day, week or year that it can be easy to forget about one simple activity that promotes autonomy and starts students down a path of lifelong learning — independent reading. Kids are increasingly immersed in their digital devices, leading some adults to worry that reading for pleasure is in danger of disappearing. But creative school librarians are proving there are plenty of great ways to get kids excited about reading on their own. English language learners are one of the nation's fastest-growing student populations. But when it comes to English learners who may also have learning disabilities, states and districts are struggling both to identify these children and to steer them to effective programs. A document from the federal Institute of Education Sciences and written by the Regional Laboratory West at WestEd outlines the challenges facing schools around English learners and students with disabilities. The document offers examples of what some states are doing around student identification and support of English learners with disabilities.